We all know that mom that makes the best guacamole by adding store-bought salsa to avocado, seasoning it with salt and pepper, and adding some magical pixie dust that no one else seems to be able to quite replicate. So we stopped trying to make guac as good as theirs and came up with our own guacamole seasoned with roasted green chiles and cilantro instead of tomato and onion. 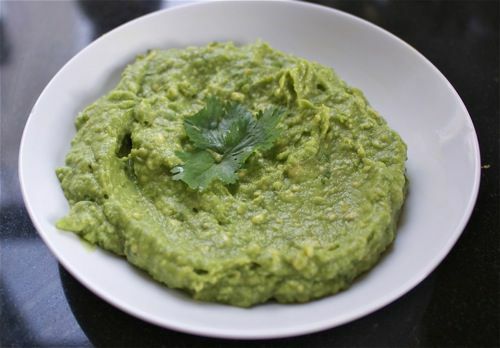 It's great with chips, on tacos, or any other way you might use guacamole. Roast chile by either toasting it directly over the flame on a gas stove or under a broiler, turning frequently. Let sit 5 or 10 minutes, pull off the charred skin, remove stem end and seeds, and mince. Meanwhile, pit avocados, scoop out the flesh and mash in a medium bowl. Mince garlic and finely chop cilantro. Add to avocado with lime juice and minced chile. Stir to combine. Add salt and pepper to taste. Serve immediately or store with plastic wrap pressed directly to its surface to prevent browning and chilled.